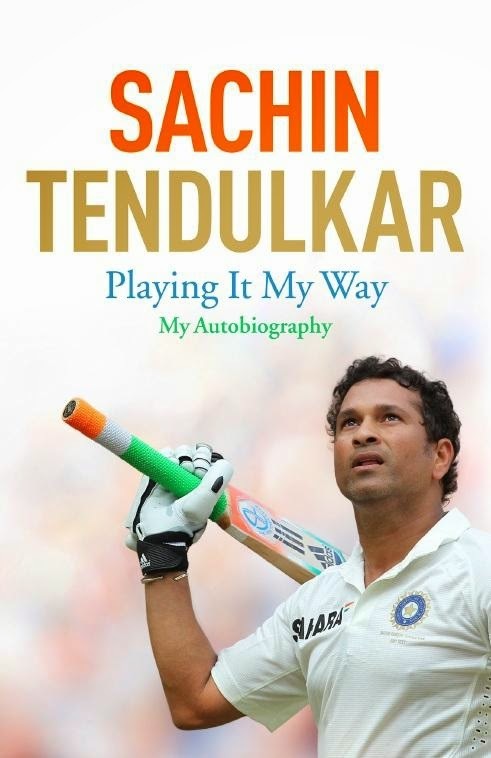 Autobiography by Cricket legend Sachin Tendulkar "Sachin Tendulkar - Playing it My Way : My Autobiography"
Cricket batting legend Sachin Ramesh Tendulkar's autobiography was released on November 5, 2014 in a high profile launch function in Mumbai. . Earlier on his Twitter page Sachin has announced the release date of his Autobiography "Sachin Tendulkar - Playing it My Way : My Autobiography" as November 6th 2014, but the book was released a day earlier. It took three years to write this book which he says as the Second innings of his life. Sachin Ramesh Tendulkar, the all time Genius of World Cricket was born on April 24, 1973 at Bombay (now Mumbai) in Maharashtra. He hold the record for scoring most runs and hundreds in Tests and ODIs. He scored a total of more than 34000 runs from One day Internationals (ODI's) and tests. He was part of the World cup winning team of 2011. He was a great all rounder. His debut match was against Pakistan at Karachi during Nov 15-20, 1989. He played his last match against Westindies at Mumbai during Nov 14-16, 2013. After a long successful career spanning 24 years he retired from international cricket and later announced his plans of writing an autobiography. Even though he had a glorified celebrity status, Sachin has always remained a very private man, devoted to his family and his Nation. Now, for the first time, he provides a fascinating insight into his personal life as well as sporting life like no other. In a press conference he said the following words pointing what would be the contents of his life story. Sachin calls his book as the Second innings of his life and it took almost three years to complete the book. Just before the fabulous launching ceremony, he presents the first copy of his autobiography to his mother. 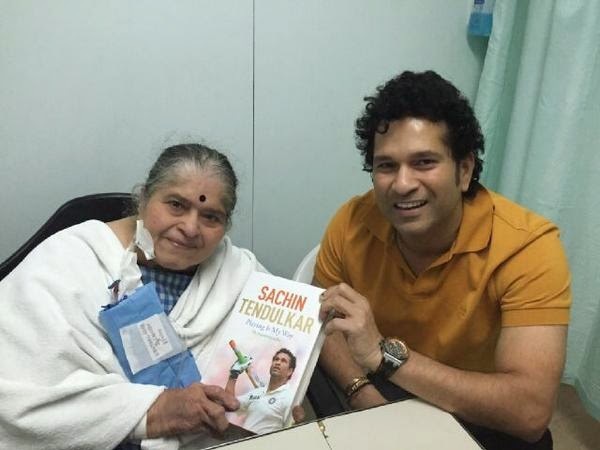 After presenting the first copy of his autobiography to his beloved mother, Tendulkar said the following words on his Facebook page and Twitter profile. "Gave the first copy of my book to my mother. Look of pride on her face was a priceless moment!" 496 paged book is published world wide by Hachette India And Hodder & Stoughton and all those who are loving Cricket and Sachin were pre-ordering before it was released. Books was released on November 5 2014, a day before the previously announced date and it is available in markets. People are rushing to the stores and online portals to get their copy. Sachin is favorite amongst of all cricket celebrities across the globe. For long 24 years he played for his Nation and is considered as the gentle man among the fellow players, He was part of the World cup winning squad of 2011. He scored most runs and hundreds in Tests and ODIs. After a successful and memorable career he retired in Nov 2013 after playing his 200th test against West Indies at Wankhede Stadium, Mumbai. He received the Bharat Ratna - India's highest civilian honor-on the day of his retirement. He started playing from his childhood days. He together with Vinod kambli set a record partnership while playing for Sharadashram Vidyamandir School. His debut in international cricket was aganist Pakistan at Karachi during November 1989. Read more about Sachin Tendulkar's Autobiography "Sachin Tendulkar - Playing it My Way : My Autobiography"
No one could forget the farewell speech by Sachin after his last international match played at Mumbai Wankhede Stadium. The eyes of the spectators were filled with tears. Sachin thanked everyone who supported and encouraged him by specifying each ones name. You can Watch the video here.